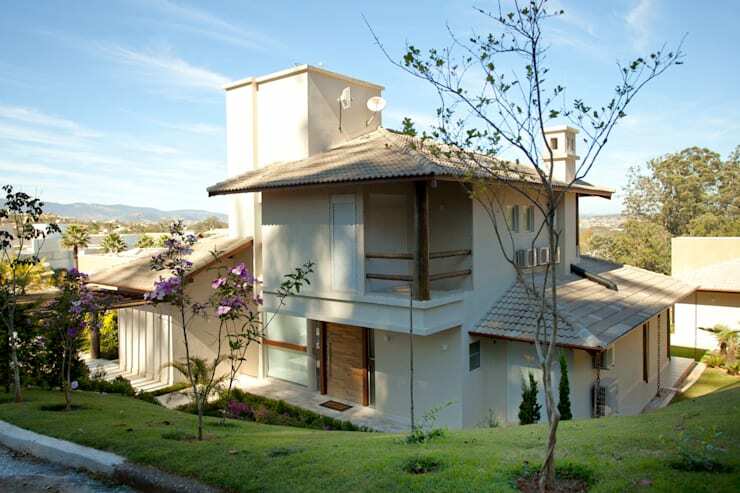 The architects at Samy & Ricky Arquitetura in Sao Paulo bring you a beautiful and stylish Brazilian house built on a sloping plot of land. The experts revamped the original house and constructed a guest house, games room and a swimming pool, so that the property feels perfect for the owners who have children and the grandmother who stays with them. 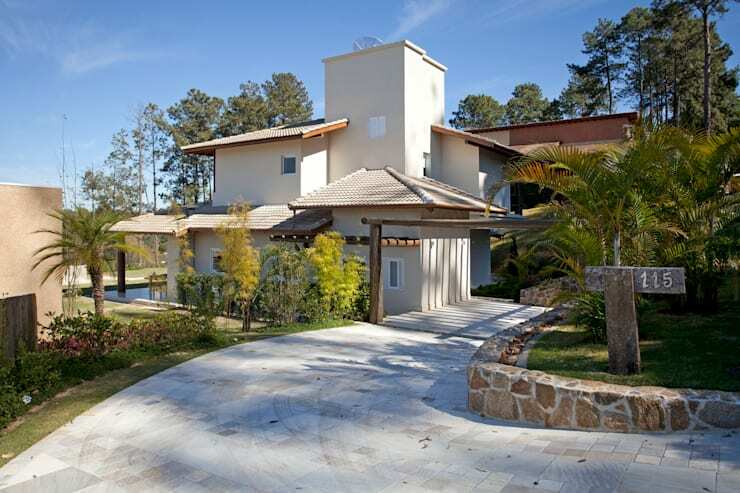 All the environments are aesthetically connected with each other, despite the slope of the land, and the surrounding greenery offers a gorgeous backdrop for the property. 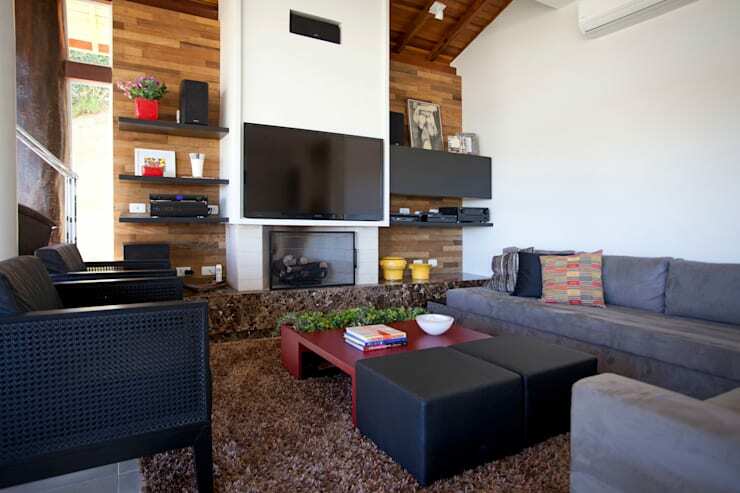 The interiors are modern and trendily furnished, with wooden elements providing warmth and cosiness. And space has been intelligently utilised too. A winding driveway lined with stone and flanked by beautiful gardens takes you to the house which looks warm and inviting. 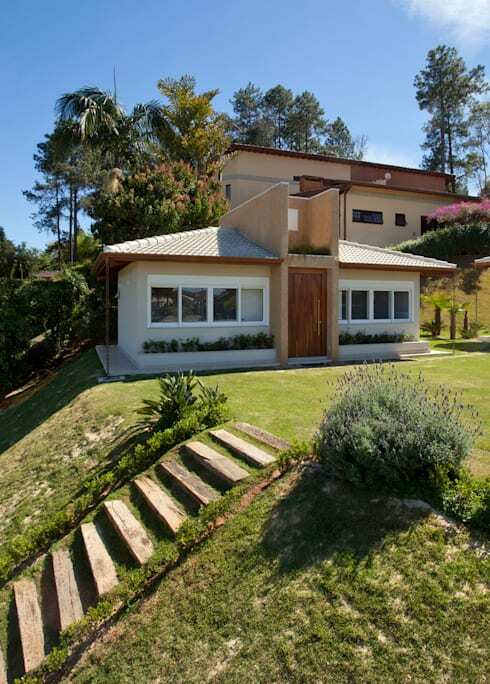 Sloping roofs lined with shingles, soft neutral colours and pretty architectural lines add to its appeal. To reach the stylish wood and glass entrance of the main house, you need to take a charming stairway that overcomes the slope of the plot. 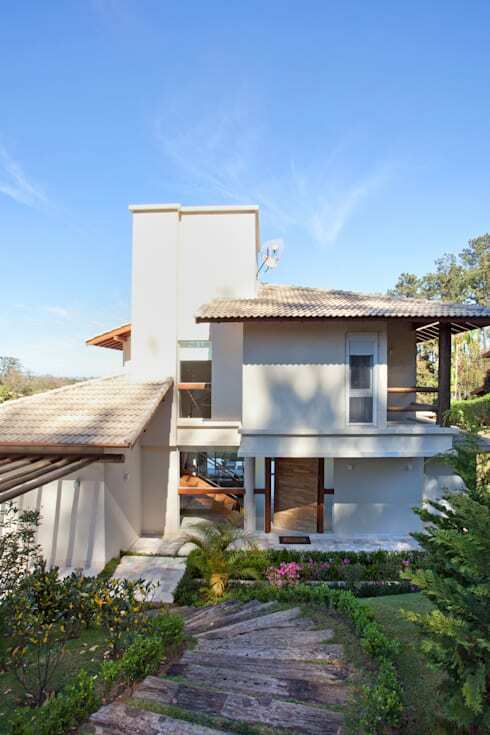 On either side, you will find lush bushes and well-maintained grassy stretches which add colour to the light-hued exterior walls. 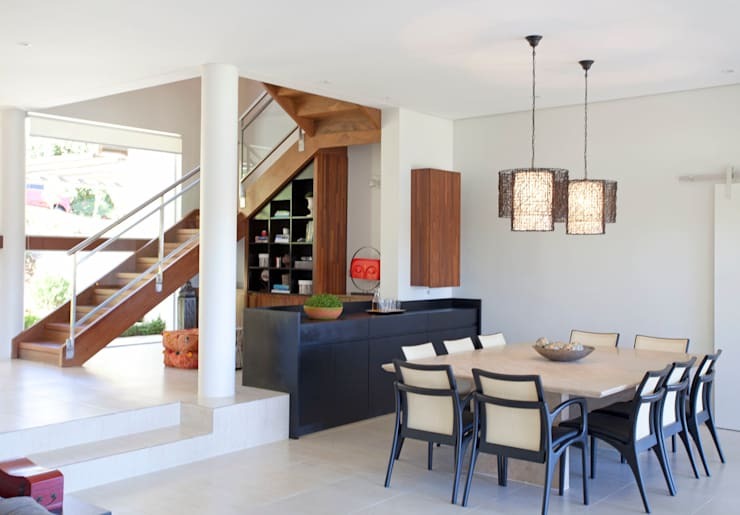 Another stairway takes you from the main residence to the games room, guest house and pool which are on a higher level. The games room is a charming affair as you can see, with its sloping roof, neat glass windows, and concrete planters holding small shrubs. 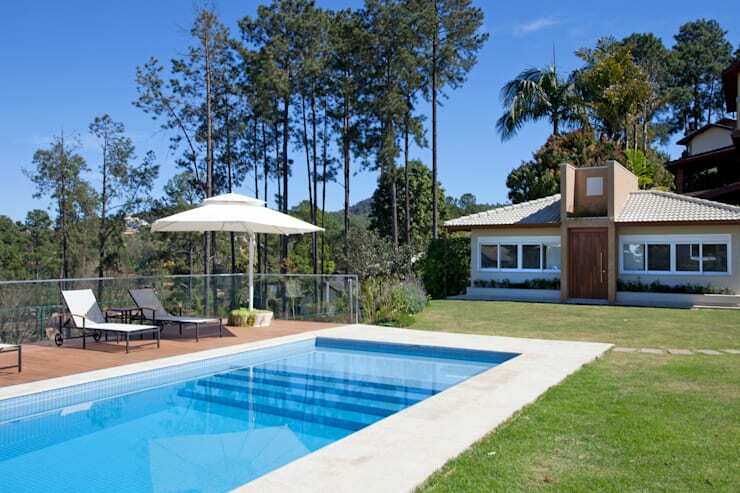 The fashionable rectangular pool is a sight for sore eyes with its crystal clear blue waters and smooth wooden deck. Modern recliners wait for you to sunbathe or relax with a book, while glass balustrades secure the pool area without destroying the view. 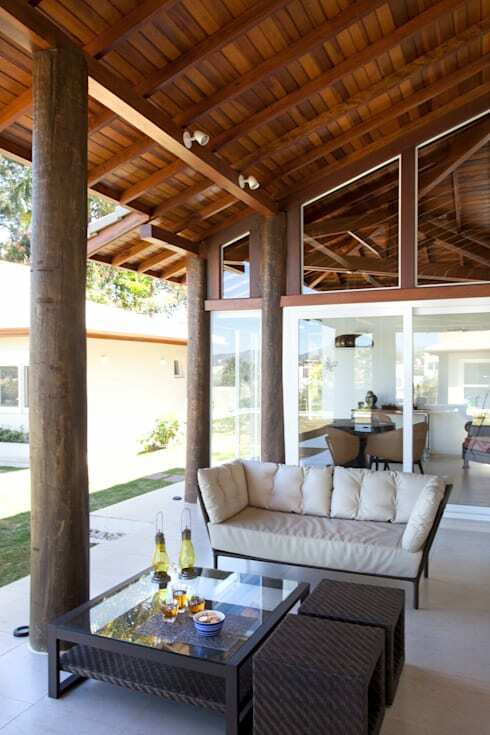 A wooden ceiling, pillars made from tree trunks, and lavish glass windows create a modern yet rustic setting for this airy terrace. Cosy rattan furniture makes the spot ideal for chatting with friends, enjoying drinks, or simply unwinding. 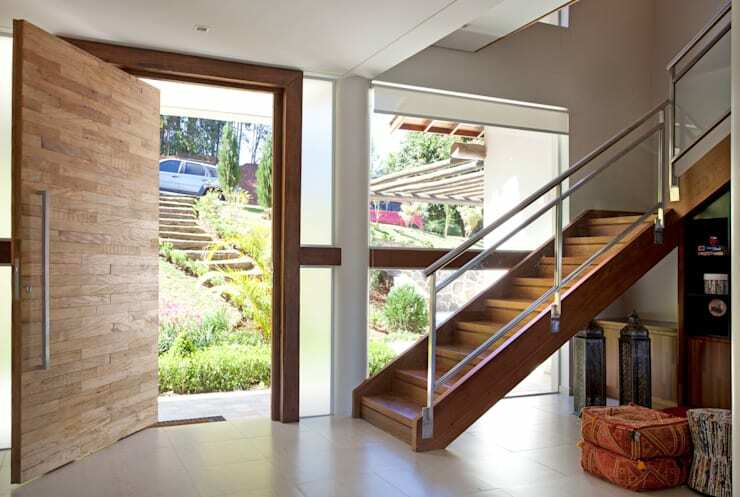 The entrance of the main house is a trendy wooden affair flanked by frosted glass panes for a modish look. 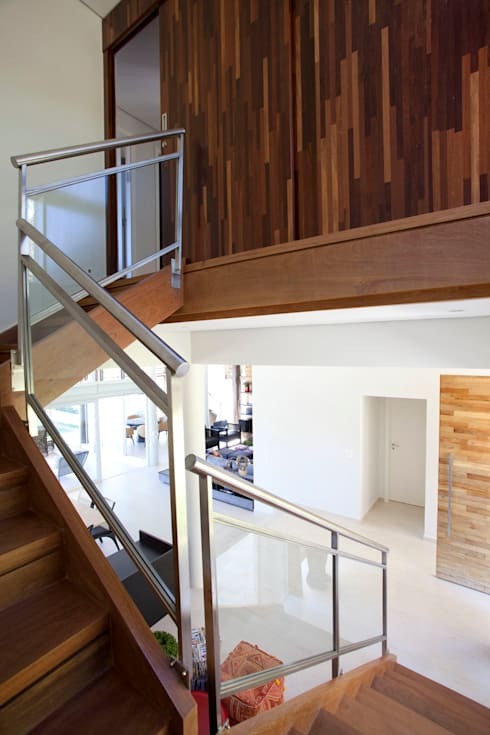 The staircase which has been remodelled is now a neat wooden structure with glass and steel for its balustrades. What a lovely sight! 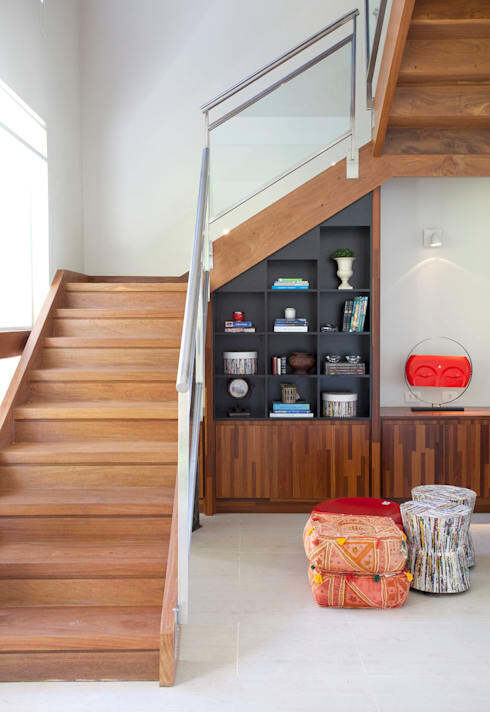 We love how the space under the staircase has been used to accommodate an in-built grey shelf which holds books and decorative pieces. A neat grey sideboard and a couple of steps demarcate the dining area from the foyer, besides offering storage room for crockery and cutlery. 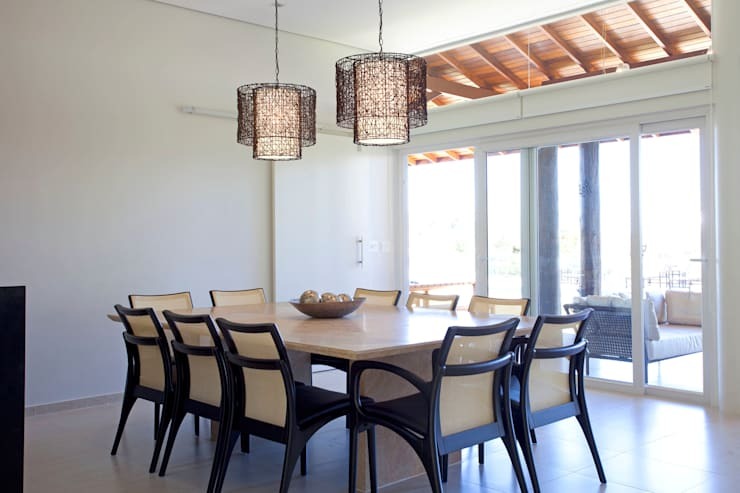 The dining furniture is simple yet fashionable, while the lamps hanging from the ceiling look extremely tasteful. 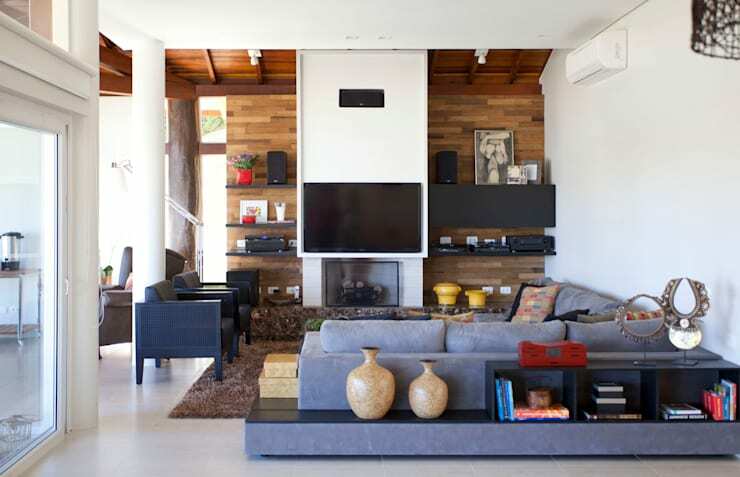 The living area is a mix of warm wooden tones and stylish shades of grey, with trendy furniture offering cosy seating. The L-shaped sofa comes with a shelf on the backside which provides storage space, while a modern fireplace under the TV keeps everyone toasty. 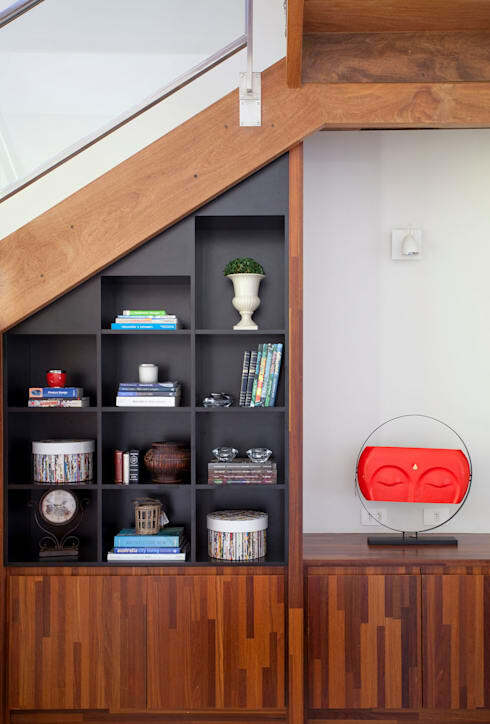 The wooden panel behind the TV features sleek, dark shelves to hold accessories and artefacts. With its sleek designs, smooth and glossy white cabinets, and large glass windows, the kitchen looks minimal yet elegant. 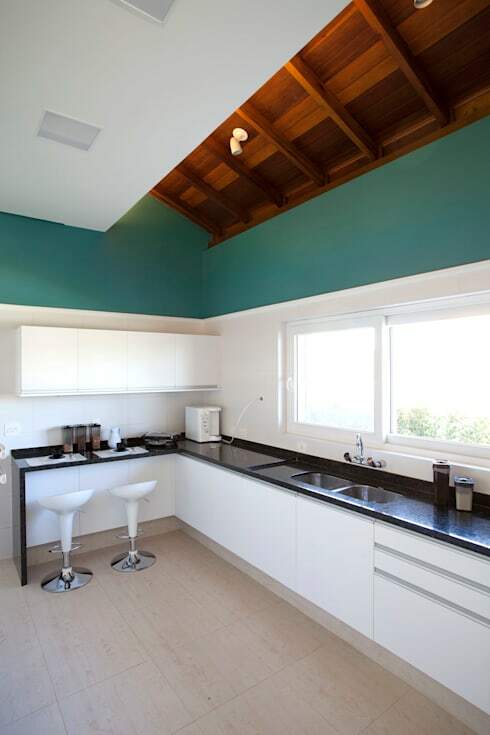 The neat black countertop breaks the monotony of white, while the ceiling features wood and a splash of turquoise for vibrancy. A soothing and neutral colour palette helps this minimalist bedroom to appear comfy and relaxing. 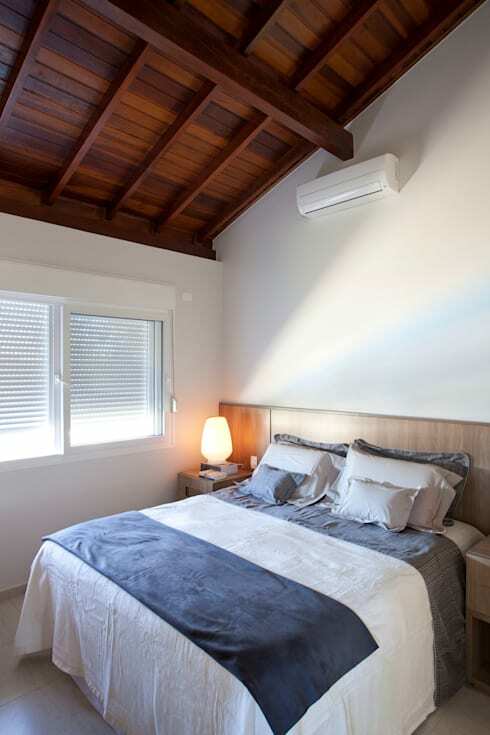 Soft bedding, a graceful lamp and a delightful wooden ceiling… what more do you need! Here’s another tour to give you more ideas - Your home can be as cozy as this chalet.